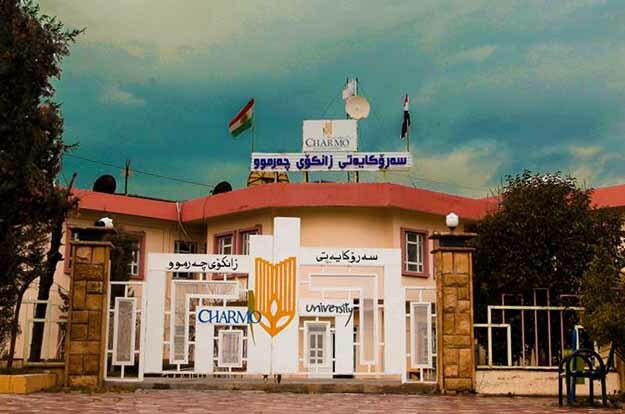 Charmo University, the newest governmental university in the Kurdistan Region Iraq located in the Chamchamal town “known the capital Martyr and Anfal, At first affiliated with the University of Sulaimani, but in Dec.8th, 2014 it becomes an independent to meet the needs of Kurdistan region. Name of the University comes from Charmo village (Jarmo), the ancient village which located east of the Chamchamal town, considered as one of the oldest agriculture village in history dating back to about 7000 BC. Today the University consists of three colleges Education, basic Education and college of public administration and Natural resource management located on three campuses and have 10 departments in different fields with research center. The University awards degrees of BSc. and MB in the scientific fields mentioned above. The Logo of Charmo University "designed by Mr. Sherko Xanzadi" refers to the name of the University and its objectives. The logo was created in a modern way. The wheat flower is a symbol of Charmo Village (Jarmo) which is the first agricultural village in human history in planting wheat. The blade of the wheat refers to greenness and the ability of surviving as well as fertility of the wheat. Pencil: a symbol of learning and education Book: symbol of culture and science Modern building: symbol of up-to-date science and a symbol of developing society. The wheat flower is (pantone orange159 c) and it is the main colour of Charmo university. This colour is a symbol of fertile soil. Additionally, the wheat ear turns into a mixture of dark orange and golden colour when it is time for it to ripe and this colour is known as the colour of work and technology. Nevertheless, the colour of dark orange is a symbol of a dry and hot summer and winter whose weather is above freezing which is exactly the climate of Garmyan and Chamchamal. A similar example of that, Austin city from Texas State of America in which Texas university is located are using same tone of colour as Charmo University. The word Charmo is written in (navy blue) pantone 2747 c). This colour stands for learning and knowledge and it leads to self- confidence and calmness. Furthermore, this colour has a great effect on body and intellect. Navy Blue pantone colour is also a symbol of honesty and proficiency. Dark green (Green pantone 349 c) in the Charmo logo is refer to agriculture and this colour is a healthy colour and leads to easing people’s mind. The colour green is known as the colour of life same as Charmo village (Jarmo) which is the oldest village in the world where people lived in. Gray colour (Gray pantone 425 c): this colour, in the world design is known as the balance colour which makes balance among all other colours. Gray colour a is a symbol of Intelligence, Brains, smart and intellect. The flag background has the same orange color (orange pantone 159 c) of the logo, and the white color of the flag represents peace and Peaceful coexistence at the capital of Martyr and Anfal (Chamchamal).